I’ve been waiting for Thomas Paul’s new pillows to come out ever since grace spotted them at the Gift Fair back in January. I love anything nautical especially when it includes a whale. The pillows are made of 100% jute. Perfect for summer houses or for anyone who loves the sea. 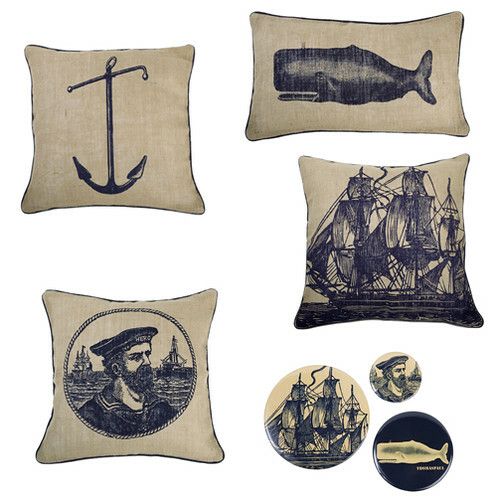 Check out my related posts links for many more nautical inspired home accessories. Allow me to introduce to you the inaugural 2009/2010 Pillow Line of FJS—a collection that is as dynamic as it is versatile. Each side of the 36 pillows bears a an original statement print. It’s like getting two pillows in one. After twenty years of creating original artwork for the fashion and home interior markets, I was ready to launch my own collection. For this range I was inspired by everything from classic Americana to Flea Markets. Nauticals re-imagined, Earthy Batiks with an urban edge and Ikats mixed with almost abstract Florals that have a painterly feel. All the pillows are hand sewn and hand printed on a fabrication that feels like a cross between a silk twill and a cool, crisp, cotton shirt. And everything is machine washable. The size of the pillows are 22″ square and and all of the designs come with a feather / down insert and if you like, synthetic inserts are available. For pricing please do not hesitate to contact me at Francis@FJSpillows.com. I hope you enjoy this collection as much as I have designing it. Very beautiful pillows! Good idea! All blogger accounts that publish via ftp were down this morning and afternoon. I just posted two posts that were set to publish this morning. Nothing to post today, Katy? Your right Megan I do her work! Here's a recent post on Sanna Annukka's new work for marimekko. I discovered your blog today as I hunted for wicker chairs. Google can lead you to wonderful new places! I adore your blog and admire your eye for design. Your personal photography work is also fabulous! Scrolling through your blog It seems like you are into folk art. I recommend you check out http://www.sanna-annukka.com/ Think you will really dig her work. These are great Katy, really fun; if it is nautical, odds are we'll like it! i really enjoy reading your blog…always new things to see that you don't find on other blogs.